Peloponnese – seat of the Gods. 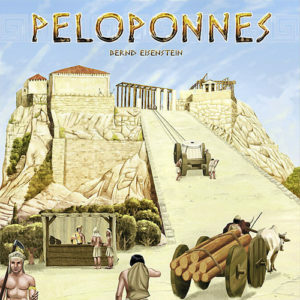 Each player represents one of 7 Peloponnesian civilizations in 1000 B.C., trying to develop it, increase its wealth and population, and become the most powerful entering the new millennium. Players have 8 rounds to develop their civilizations, adding territory through Land Tiles and prestigious buildings through the Building Tiles. These increase the civilizations’ inhabitants, luxury, wealth and power. Only through a balance of inhabitants, land and buildings can a player claim victory and join the heroes of Peloponnesian history. Peloponnes affords appealingly Gameweight with reasonable duration. The game includes an solo-game to get easier into gameplay and a level-system to get better and to be more challanged. Game components are language-independent. German and English rules included. » English rules (1,1 MB). » French rules (1 MB). Thanks a lot to Stéphane Dehouck! » German rules (1,1 MB). » Hungarian rules (597 KB). Thanks a lot to Károly Dudás! » Japanese rules (3 MB). Thanks a lot to Hiroshi Nagamine! *** The forth printrun 2016 is a copy of the 2014 printrun with minor changes in the rulebook.